Accommodation on twin sharing/double occupancy with breakfast. Lunch and Dinner at selected local restaurants. Government approved required category hotels on twin sharing basis. All airport pickups and drops in Paro. Ground transport in comfortable private vehicle in Bhutan during the tour. Experienced English speaking guides and local staff during the tour. All city tour with permits and entrance fees for museums and monuments. Items of a personal nature (personal gear, telephone calls, beverages, internet, laundry etc). Trip cancellation and Medical/Evacuation Insurance. Tips for Staff (guide and driver). On arrival at Paro international airport you will be received by our representative and transfer to Thimphu by private car. Check into your hotel. Delicious lunch will be served at your hotel and afternoon we will proceed for city sightseeing. Visit Memorial chorten, stupa built in the memory of our late 3rd king. This large impressive monument with its golden spire was built in 1974 to honour the memory of the third King, His Majesty Jigme Dorji Wangchuck (1928 – 1972).Built by his mother Her Majesty the late Queen Ashi Phuntsho Choden Wangchuck, the whitewashed chorten is decorated with richly carved annexes facing the four directions, and features elaborate mandalas, statues and a shrine dedicated to the popular third king. There are numerous religious paintings and complex tantric statues housed inside reflecting both peaceful and wrathful aspects of Buddhist deities. The memorial chorten, with its sun-catching golden finial, is one of the most visible religious structures in Thimphu, and for many people it is the focus of their daily worship. Throughout the day people circumambulate the chorten, whirl the large red prayer wheels and pray in the adjacent shrine. The early morning is particularly tranquil as elderly people shuffle in and spruced-up kids on their way to school whiz in and out to pay homage.Visit the massive statue of Shakyamuni measures in at a height of 51.5 meters, making it one of the largest statues of Buddha in the world. The statue is made of bronze and is gilded in gold. 125,000 smaller Buddha statues have been placed within the Buddha Dordenma statue, 100,000 8 inch tall and 25,000 12 inch tall statues respectively. Each of these thousands of Buddhas have also been cast in bronze and gilded. The throne that the Buddha Dordenma sits upon is a large meditation hall. The Buddha Dordenma is located atop a hill in Kuenselphodrang Nature Park and overlooks the Southern entrance to Thimphu Valley. 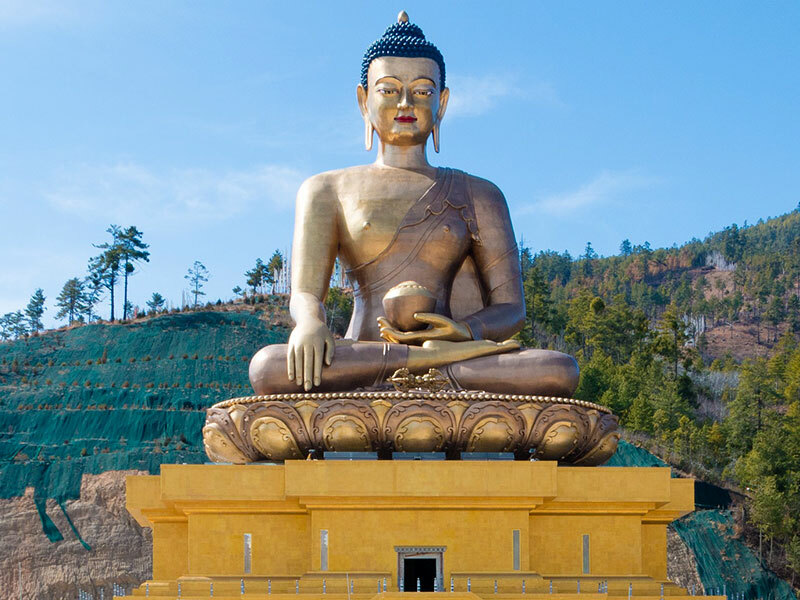 The statue fulfills an ancient prophecy dating back to the 8th century A.D that was discovered by Terton Pema Lingpa (Religious Treasure Discoverer) and is said to emanate an aura of peace and happiness to the entire world. After our leisurely breakfast we will start our day visiting handmade paper factory, visit painting school, nearby folk heritage museum and national library. Lunch in the town, after lunch. Trashichhodzong: This impressive fortress/monastery houses Secretariat building, the throne room of His Majesty, the King and various government offices. It is also the summer residence of Chief Abbot and central monk body. Then, visit the government-run Handicrafts Emporium and local crafts shops, to browse through example of Bhutan's fine traditional arts. Here you can buy hand-woven textiles, thangkha paintings, masks, ceramics, slate and wood carvings, jewelry, interesting items made from local materials.Later leisure time at the hotel. After our delicious breakfast, we will checkout from the hotel and proceed to Punakha. En-route we will stop at beautiful Dochula pass at 3050m. The pass offers charming views of the entire northern Bhutanese Himalayas during a clear day. Continue your drive to Punakha. Enroute hike to Chhime Lhakhang, lies on the periphery of the expansive valley of Lobesa where the borders of Thimphu, Punakha and Wangduephodrang districts meets. Perched on top of a little hilltop overlooking the Puna Tsang Chhu, Chhime Lhakhang is auspiciously surrounded by the nine Khas or villages namely Sosokha, Yuwakha, Gangmakha, Septokha, Sembjikha, Pachakha, Buewakha and Gangkhar.Around the time when Drukpa Kuenley first visited Bhutan, a demon called LoroDuem resided on a high pass presently called Dochu La. She terrorised all who tried to cross the pass and the people in the valley lived in fear. Two more demoness lived on two smaller passes and the three of them caused people misery and suffering. When Drukpa Kuenley heard of this, he hunted down the demoness at Dochula and the three demoness recognising Drukpa Kuenley power ran down the valley and two demons dissolved into the body of LoroDuem. When she reached the plains of Lobesa, she transformed herself into a dog to avoid detection. But Lam Drukpa Kuenley recognised the demoness dog, killed it and buried it under the mound of a hill, which he said resembled the breast of a woman. He then said "Chi-med" (no dog), and built a black chorten on top of this mound. Before killing and burying the demoness, he made the demoness pledge service to the Buddha and become a protector of the dharma. She is now the local deity called Chhoekim who is the guardian deity of Chhime Lhakhang. His cousin Lam Ngawang Choegyal later built a Lhakhang in honour of his illustrious relative and named it Chhime Lhakhang. It is widely known today that most of the thousands of people who visit the lhakhag do so to pray for children either to ask for children by those who are childless or to seek protection for children that they already have. While Chhime Lhakhang is renowned for its fertility blessings, it also fulfils the other religious and spiritual needs of the people. After breakfast visit Punakha Dzong. Zhabdrung Ngawang Namgyel, the founder of Bhutanese state, built Punakha Dzong in 1637. It was originally named Puntang Dechen Phodrang Dzong, which means the Palace of Great Bliss. Punakha Dong was built on the 8th day and 8th month of the Fire ox year in 1673. The Tibetan attacked the dzong in 1639 and 1644. The defenders successfully repelled the attacks. To commemorate the victory, a New Year festival was introduced and Yu Gyal Gonkhang Chen Mo, "the great shrine of the protective and victorious lord" was built. The first King of modern Bhutan was crowned in Punakha Dzong. Punakha Dzong remained the centre of government until it was relocated to Thimphu. In 2011, the wedding of the 5th King was held in this fortress. 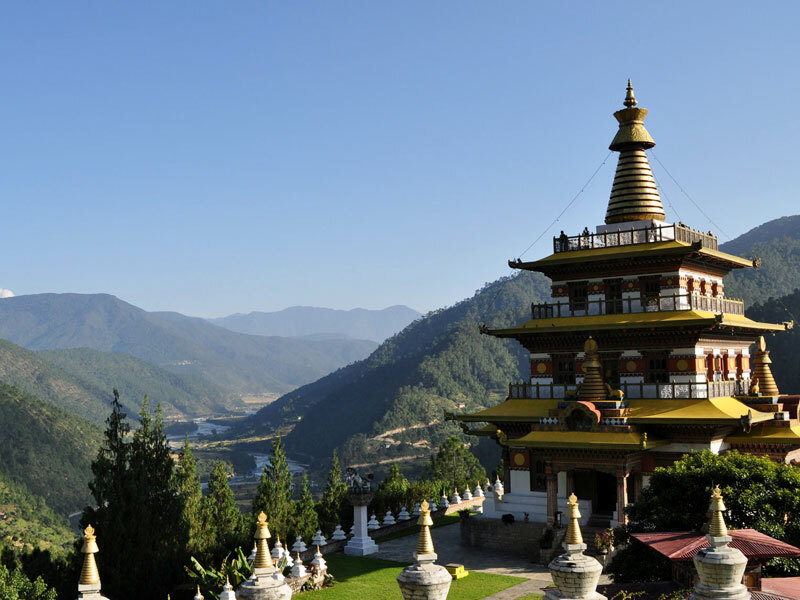 Later hike Khamsum Yulley Namgyal Chorten stands out on a beautiful ridge above the Punakha valley. Her Majesty built the Queen Mother, Ashi Tshering Yangdon Wangchuck it. It took 9 years to build and Holy Scriptures rather than engineering manuals were consulted to construct this 4-storey temple. 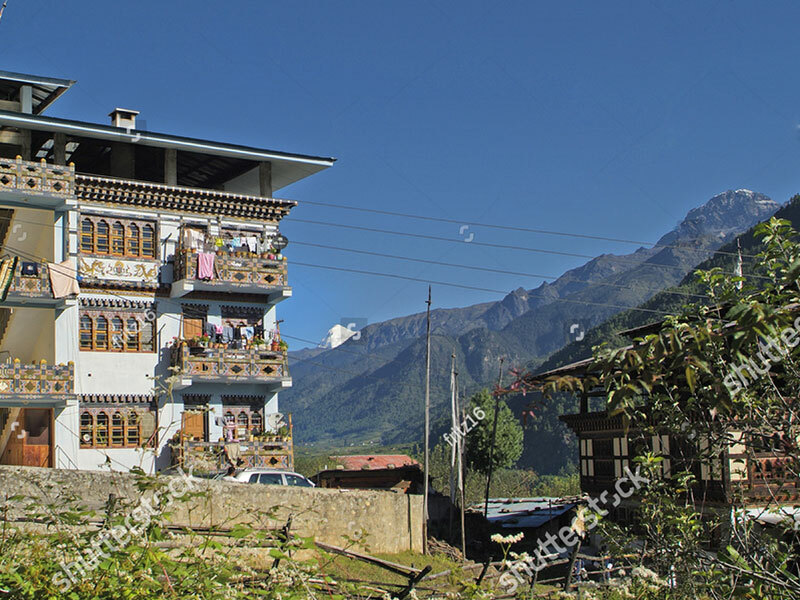 It is a fine example of Bhutanese architecture and artistic traditions. This temple has been dedicated for the wellbeing of the kingdom, its people and all sentient beings. It is a 30mins hike from the suspension bridge.The Chorten would take a one-hour hike to approach. It offers a beautiful view of the Punakha Valley. While returning we will follow the path through the beautiful village of sonagasa and take a small hike of 1 hr. After breakfast drive to Bumthang enroute stop at Trongsa. Visit the Trongsa Dzong the most impressive Dzong in the Kingdom and perched on a strategic position above the Mangde Chu (river). This Dzong is the ancestral home of Bhutans royal family. Also visit the Ta Dzong an ancient watch tower and Chendebji Chorten (Stupa). Later continue drive to Bumthang. After breakfast full day sightseeings in Bumthang includes walk across the fields from Jampa Lhakhang. It is surrounded by a huge white painted wall with 108 small chortens on the top. From the temple you can drop down to the river, cross a bridge and walk to Tamshing Goemba, and Konchogsum Lhakhang. Also visit Kurje Lhakhang and Swiss Farm, only farm in Bhutan which makes Bhutanese assorted wines, beer and cheese. If time permits visit Mebartso “Burning Lake” where Terton Pemalingpa, a treasure revealer is believed to have taken out a hidden treasure from the lake. These treasures were believed to have been hidden by Guru Rinpoche in the 8th century to be revealed by special persons at a propitious time. Today drive to Gangtey , the winter home of Black necked crane which migrates from Tibetan plateau.On arrival check in your hotel. Later visit Gangtey Goemba or you can start walking from the Phobjikha till the monastery. Morning visit Blackneck crane center. Later drive to Paro . Lunch would be served enroute at one of the famous restaurant in Dochula . Check in your hotel at Paro. If time permits visit Ta Dzong, built in 1651 as a watchtower to protect Rinpung Dzong, and in 1968 inaugurated as the National Museum. The extensive collection includes antique thangkha paintings, textiles, weapons & armor, folk arts, relics, coins, postage stamp and a small natural history display. Then walk down the trail to visit Rinpung Dzong, which has a long and fascinating history. After breakfast, take an excursion to Taktsang Monastery. Legends say that Guru Padsambhava came here flying on the back of tigress and meditated at the place where now monastery stands. Taktsang or Tiger Nest was severely damaged by fire which took place in April 1998 and now it has been restored in itsoriginal splendour. After reaching to Paro then visit 7th century Kyichu Lhakhang, one of the oldest and most sacred shrines in Bhutan.